The LHC cold check-out, during which all equipment is run simultaneously as if there were beam in the machine, was completed successfully before the Easter weekend, well ahead of schedule. The Good Friday LHC morning meeting ended with a statement that the accelerator was ready for beam injection, signalling the start of the 2018 proton run. In the weeks before Easter, the injectors tuned the low-intensity single-bunch beam to make it ready for use by the LHC. The bunch intensity was set to around 5x109 protons (the nominal bunch intensity is around 1.2x1011 protons). The process for the first injections is to inject a single bunch and make it travel through the first sector (roughly 1/8 of the LHC’s circumference), after which it is absorbed by collimators, which are closed further than usual. The operations team measures the trajectory of the bunch through the arc and makes adjustments where necessary, before opening the collimators for the next injection to allow the beam to travel through two sectors. This process is repeated until all sectors have been corrected and the trajectory of the beam is deemed sufficiently good. This process resulted in beam 1 (clockwise) circulating at 12.17 p.m. on Good Friday and beam 2 (anti-clockwise) following only 20 minutes later, an impressive six days earlier than scheduled. Once these circulating beams were established, the real beam commissioning work started. The functioning of the beam instrumentation was checked, the different feedback systems adjusted, the optics measured and corrected and the collimators aligned to protect the machine against excessive beam losses in unwanted places, such as the superconducting magnets. All this is easily said in a single sentence, but it takes many shifts and a substantial number of experts to complete the work. The initial beam commissioning is done without colliding the beams in the experiments. First collisions had been scheduled to take place with only a few bunches on Monday, 23 April. However, thanks to the faster than expected progress and small number of minor issues encountered, two beams, each consisting of two nominal bunches, were collided in all experiments at 11.13 a.m. on Thursday, 12 April. Following these first collisions, a period of alternating commissioning and intensity ramp-up will take place. The final beam commissioning steps will be interleaved with colliding beam being provided for the experiments, with the number of bunches increasing stepwise. Each step will require at least 3 cycles and an accumulated stable beam time of 20 hours. Experts will then evaluate the measurements taken on the different systems and establish formal approval to go ahead with the next step. Again, this process will be repeated until the maximum number of bunches per beam (2556) is established. 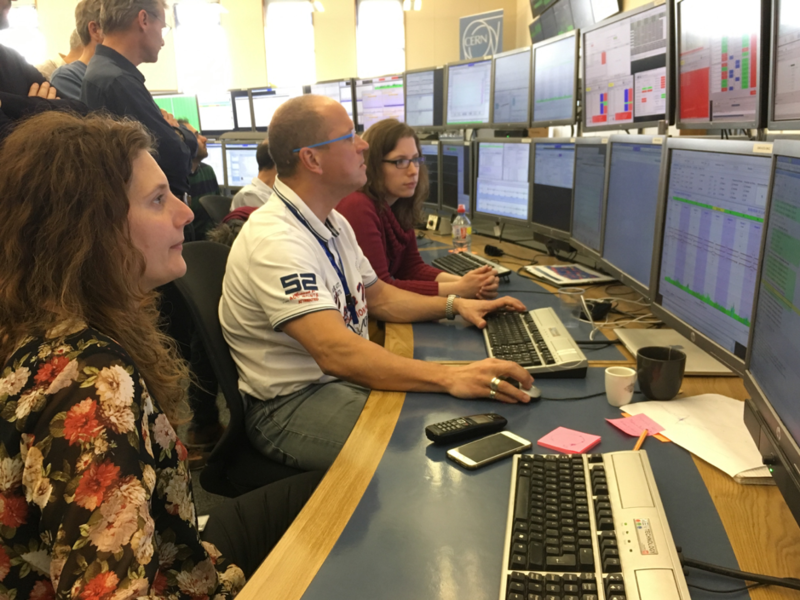 During the January LHC performance workshop in Chamonix, it was agreed that collisions with 1200 bunches per beam would mark the start of serious data taking. If all goes well, this should happen around 4 May – again, well-ahead of schedule.